(Before you continue reading, this is NOT nomnomnom, the usual writer for this blog. Instead, in sort of a request, nomnomnom has been asking me to write a guest post for a while and, due to my recent trip, I thought this was a good topic to do so). Where to start? 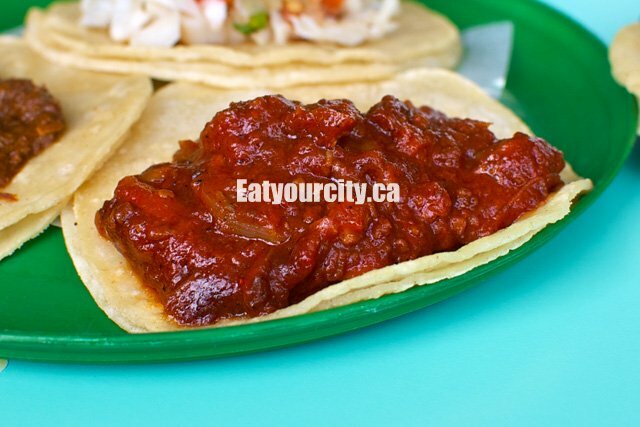 How about we do so with the baseline, i.e., a taco made in Mexico City? These tacos were made in a regular taquería, one which would be frequented by regular Mexican folks for lunch (I walked by later at night and they were closed so I will assume it is only open during certain hours of the day). When ordering, the waitress - an "old" woman with a pad and pencil - would take our orders and then provide us with the food. The tacos were served along with radishes, cucumber and a local herb called papalo. And, what I thought was quite weird (from a non-Mexican perspective), some tacos were topped with french fries. Similar to the signal of a good sushi restaurant, you would order the tacos by the unit, i.e., you would order two or three at a time. Once you consume them, you would order more. If you would be pushed to make a complete order at once… Well, they felt it was sort of pushing things. That also leads to another detail: there is no such thing as one order consisting of three or four tacos of the same type. You order what you want to eat. Likewise there is another key detail to observe: Notice that tortilla? Specifically, there is only one? As I was explained, there is no written rule on how many tortillas should be in a taco: it is usually left to the taquería and the filling. In the case of the filling, if it tends to be wet (for example, braised or stewed meats), they might use a second one for structural purposes. 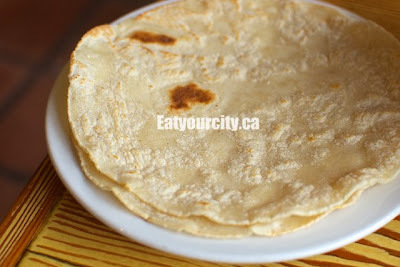 As for taste and texture, the tortilla was there mostly for containment of the filling. It was thin and you could taste a little bit of it, not much. Some of the fillings were juicier than others but, in a way, it was the intent of the filling itself. 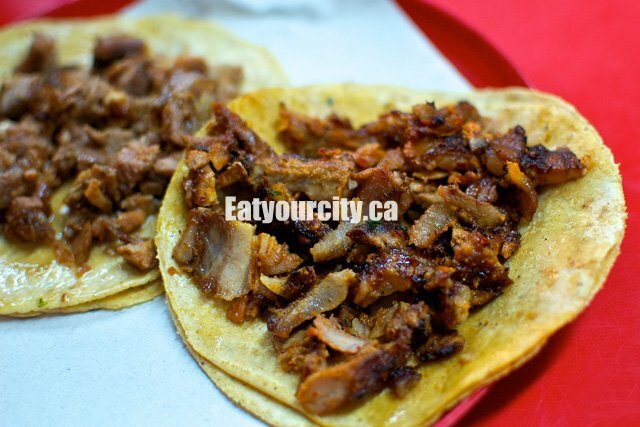 For example, the chorizo was cooked through a lot more than the meat from al pastor. What was overall unique was that not much was made about it: that's what they expected. Then again, this is something they eat on a frequent basis and everybody seem had their favourite shop. 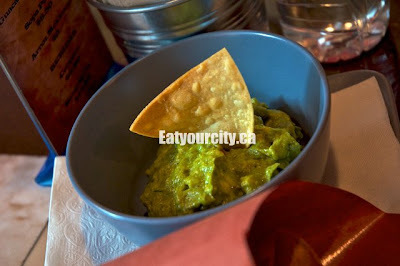 Now that we have set up my baseline, i.e., authentic food served to regular folks - not food served in an all-inclusive resort which caters what tourists think is the real deal - let's take a look at the offering from the restaurant in question: Tres Carnales. 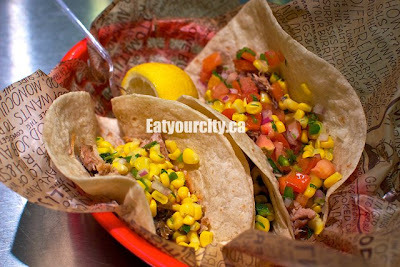 It is quite obvious the tacos are different from the ones I had in Mexico. 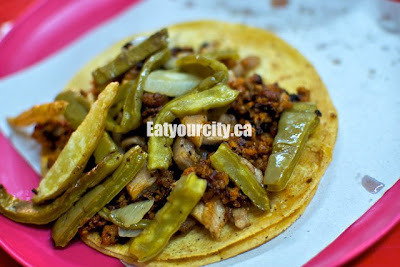 From the type of tortillas used (given it looks so regular shaped, it would indicate mass production) to how they were dressed (cilantro and onions), it is somewhat evident these are not the same type of tacos I consumed in Mexico City. After checking with a Mexican friend, he confirmed that what people consume outside of Mexico is usually the style produced in the northern regions. In a way, that would make sense, as they neighbour the United States and would more easily "flow" towards the American side and eventually further north. As for the product itself, as mentioned, I thought it was OK. Meats were cooked through, though, I wished a bit more on the juicy. After all, you have the second tortilla for structural integrity! In terms of salsa, they are provided on the side but, alas, they are limited to what is served to you - you don't necessarily have an option to choose the one you want. Furthermore, the mix-and-match issue: the orders I made had four tacos but you can't mix and match the ones you want. Or order a single one for that matter. As for me returning, well, I am not the biggest fan of tacos (prefer other forms of Latin cuisine) so it is a case of I don't care. 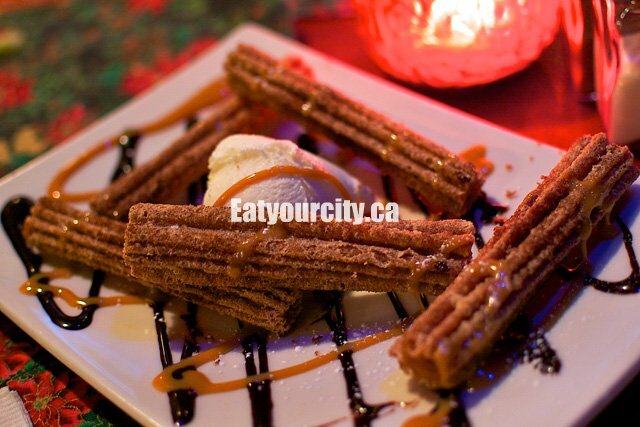 Not related to tacos; but, to those interested, they have churros! 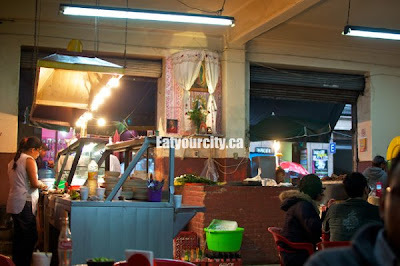 However, looking at some of the dishes, actually it is possible the restaurant itself is Peruvian. OK, I am digressing here and let's go with their taco offering. In terms of ordering, it suffers the same "issue" as Tres Carnales: they do not offer mix-and-match (I asked) and their order is made up of four tacos. 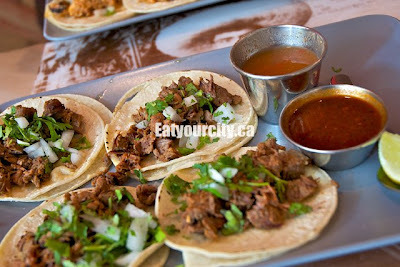 However, unlike Tres Carnales, it comes with three salsas (with different levels of spiciness) as well as a side of beans. And, unlike Tres Carnales, the "filling" is contained in a single tortilla. Flavourwise, I only wished the meat were more caramelized. But then again, this is more in terms of style. 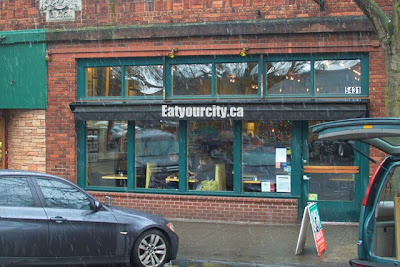 There is a joke that, in terms of cuisine, whatever hits Vancouver, it will eventually hit Edmonton a year or two later [*]. In Vancouver's case, tacos craze came around two years ago with La Taqueria (despite there has been more traditional Mexican restaurants, for example, Doña Cata). 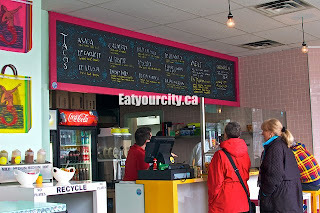 So, for comparison purposes, I visited their second location and ordered several of their tacos. Unlike the tacos I ordered in Tres Carnales, I ended up ordering stewed meats tacos - in this case, beef cheeks (cachete), beef tongue (lengua), pollo con mole, fish (pescado) as well as one of their vegetarian options (tinga de hongos). Granted a sort of 1:1 comparison can't be necessarily made since I ordered different types of meat as the ones I ordered in Tres Carnales but one thing is quite obvious: it follows a similar pattern of two tortilla. However, on the flip side, you are allowed to mix-and-match. In fact, you can order only one if you wanted to. Pricewise, they are better set up: most of their tacos are $2.50 a piece or $9.50 if you order four (slightly cheaper if vegetarian options were chosen). As for salsas, it is self-serve so you can tailor it the way you want. [*] That does not mean trends can't flow the other way either. While Edmonton have had Famoso for a while, the craze for Neapolitan pizza hit Vancouver recently. 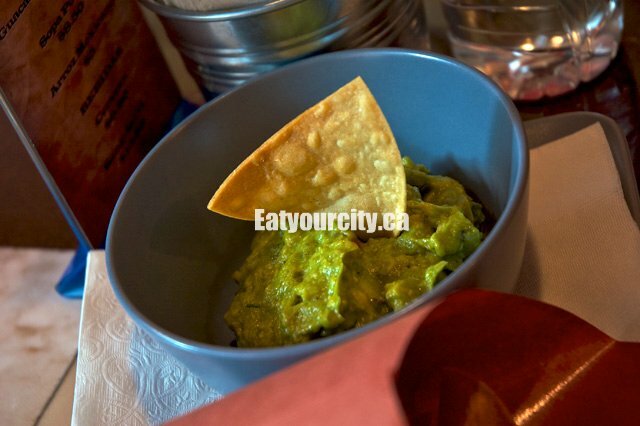 In fact, Famoso is scheduled to open locations in BC later this year. As for the food itself, well, not sure if it was because I chose the stewed meat options but they didn't really shine that much (which I found odd as my previous visits to their first location provided better final products). 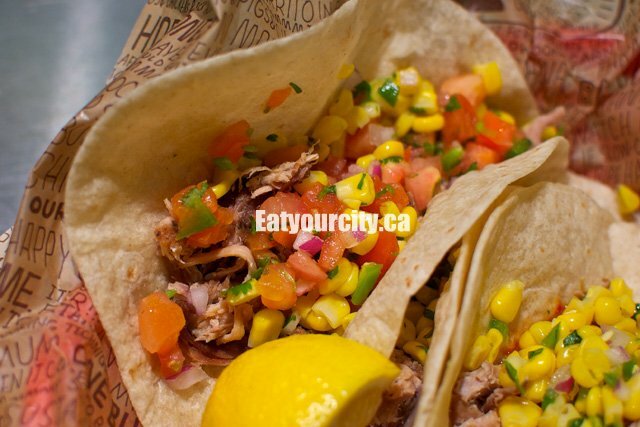 Furthermore, the extra tortilla muted the existing flavours. 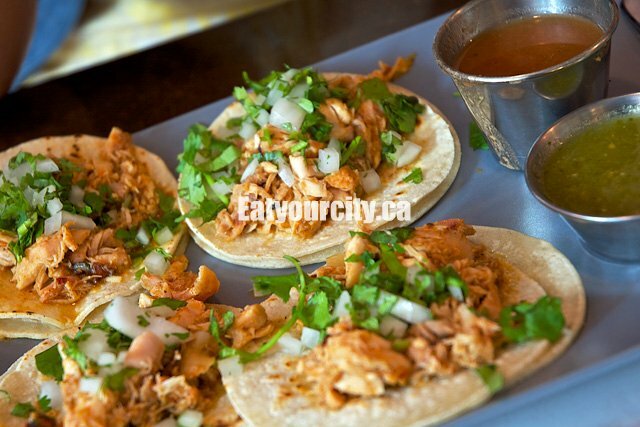 Is Tres Carnales better than La Taqueria? Well, again, since it wasn't a 1:1 product comparison, I can't say. If I use my previous experience, I would say they are not that different. 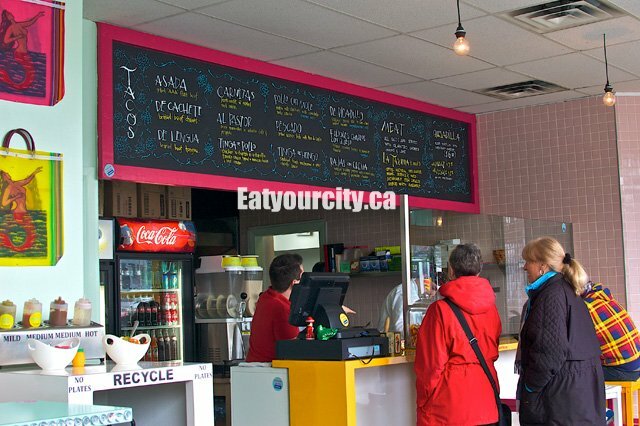 While Edmonton "complain" they wish they have the same type of cuisine options as Vancouver (something that Edmontonians should blame themselves due to the steak-and-potatoes culture as well as being too conservative and "safe" in terms of food), Vancouverites at times wish they had the same options as their neighbours in the South, namely, Seattle. In this case, I was in a trip down there and decided to stop at…Chipotle?! OK, some of you might be coughing at this but, let's face it, for argument sake, one should include crazy options. In no way Chipotle would fall in the same category as the other options discussed here but I threw it in for one reason: perception. When general public think that is the "real deal", you know that everything will go south from there [**]. As for Chipotle, alas, I don't think what I ate was representative at best: I was there after a long drive and it was quite late (~9:00 p.m., restaurant close at 10:00 p.m.) by the time I got there. Read: the food wasn't fresh and I was a bit tired. Still, by trying their food I got the key note of the intent of the restaurant: in no way it was meant to be "authentic" or traditional. Rather it is just to feed people with what they want to eat. On that note, the order above has three tacos and I asked them topped them with the three different salsas they had. Corn happened to be one of their toppings. [**] Trivia time: In terms of authenticity, which serves "better" Chinese food, P.F. Chang's or The Lingnan? Answer: neither one. If you consider dishes such as Lemon Chicken and Ginger Beef to be Chinese, that would be as French as french fries. 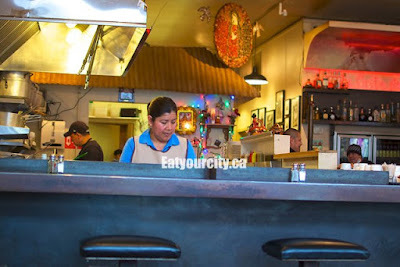 So, that brings to the actual Mexican restaurant I visited: La Carta de Oaxaca (literally, Oaxaca Menu; "La Carta" from here on). 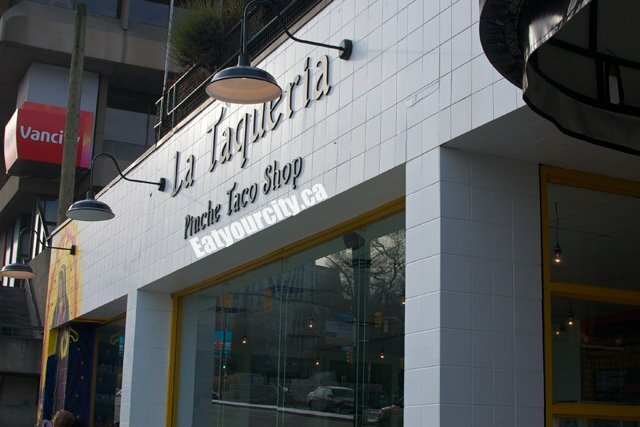 Actually, I wasn't intended to visit this restaurant for their taco - had I really wanted to tacos in Seattle, I would have rather gone to a food truck. Instead, I was there for another dish and tacos ended up being collateral damage. However, it was a good collateral damage in a way because the preparation was closer to that experienced in Mexico, namely the tortillas were made to order by a tortillera [***] on-site. [***] Just in case, in the case you google this word, the regular definition, not the OTHER definition. Now THIS is a taco! Anyway, here is what was ordered - tacos de carne asada. 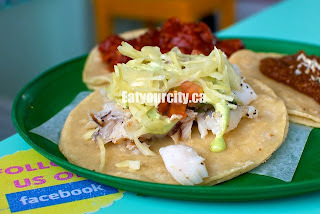 Out of all tacos I ate in this culinary trip, outside of Mexico, this was the best I had. It wasn't only the fact the tortilla was thin and only provided some containment to the filling without interfering (tastewise) with the rest; but it seemed as if each part as a role: The salsa was there to provide contrast (in this case, some heat - and while it is served on the taco, they have a salsa bar, too) to the savoury meat - which itself was juicy and caramelized. 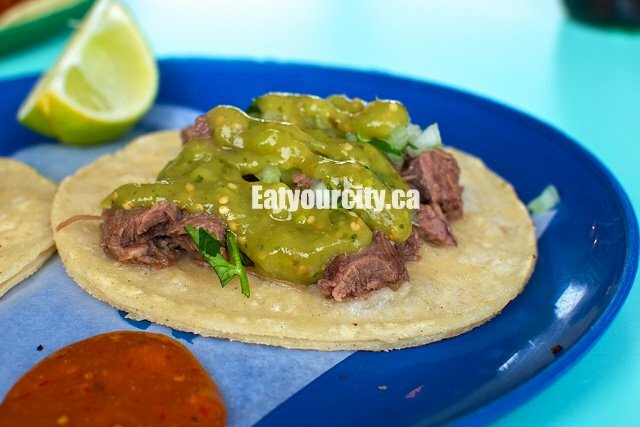 Of course, a price had to be paid: an order which contains two tacos were US $6.00 (for purposes of this post, an almost CDN $1:US $1 reference point can be used). Hand made tortilla - made on-site. Notice the irregularities. Putting that aside for a moment, here is the dish I wanted to try actually: mole. In my opinion, if there was a Mexican dish that you could make an analogy of a human melting pot, that would be a mole. Somehow similar to curries in India, each family has their own unique version of mix of chile peppers, spices and chocolate and, with each generation, it "intermingles" and a new variety results. However, it still maintains some major characteristics - that of spiciness, sweetness and bitterness. 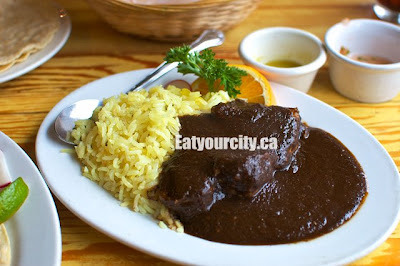 In the case of the mole at La Carta (which specifically serves mole Oaxaqueño, i.e., specific to the southern region of Mexico), this mole has a more chocolate-y flavour compared to the ones I have tried outside of Mexico (the ones I tried in Mexico City were balanced). 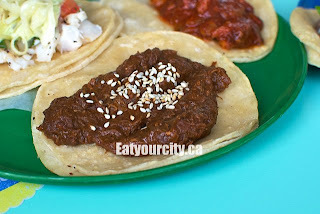 Alas, while the sauce was good, the pork from the mole wasn't that good. In a way, it felt it was stewed pork meat which was mixed with the sauce when ordered, rather than cooked in it. Regardless, this is just a side note: I was there specifically for the sauce and it delivered. Side effect from being too popular? 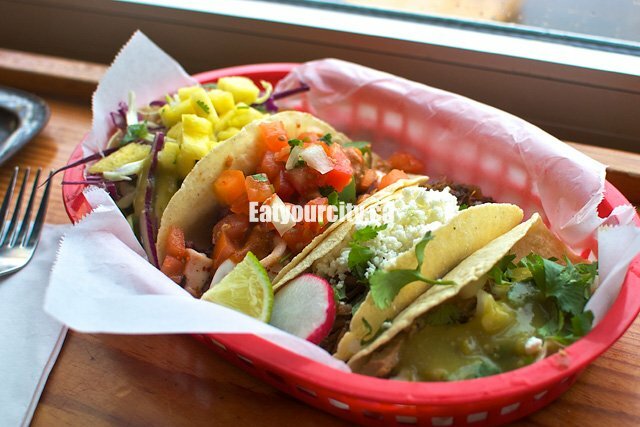 Finally, to close this round-up of taco places, Portland. Yes, the place currently hyped with food trucks and… Well, I chose not to visit a taco truck this time (I have been there in the past) and, instead, visit an actual sit down taquería called "¿Por Que No? 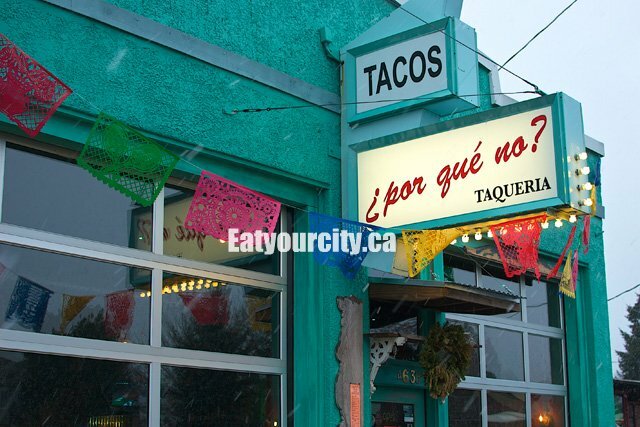 Taqueria". After all, why not! (if you didn't get the joke, "¿Por Que No?" 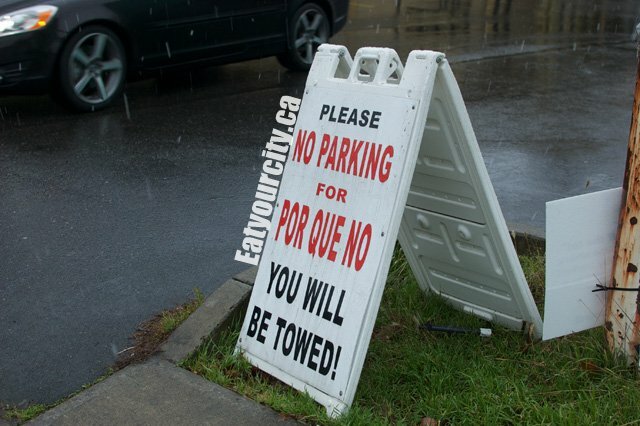 literally translates into "Why not?"). I arrived after 3:00 p.m., just in time for their 3:00 p.m. to 6:00 p.m. daily special, where every taco is $0.50 less. Probably because of this, gluttony took over and ended up ordering 4 tacos. I think the different tacos served in ¿Por Que No? actually shows one of the conclusions I would like to make: there are different style of tacos. 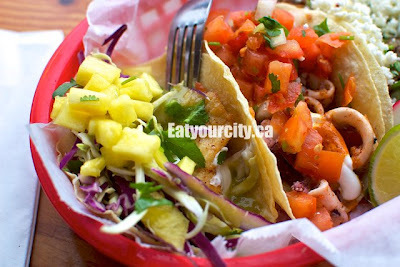 The more "traditional" versions are topped with only cilantro, onions and some salsa (alas, I wished it was served on the side or for the customers to self-serve); but the fish taco has fancier toppings, in this case, the pineapple. In the case of the calamari, well, it was literally a squid stew. One more note: notice it has one single tortilla? However, unlike the stewed versions of La Taqueria, the stewed meats from ¿Por Que No? was actually able to shine. I was able to taste a bit of the pork, a bit of the seafood-ness from the squid and so on. It didn't feel as if I was chewing masa with something that provided a different "bite" to it. 1) Tacos is not a single entity type dish. A perogie you would find in Edmonton can be pretty much the same as the one you would find in Ukraine, in terms of tacos, it can be quite different as you can see from the pictures. 2) Before jumping in wildly, almost without thinking, to "defend" the restaurant, ask yourself: what is your comparison point? 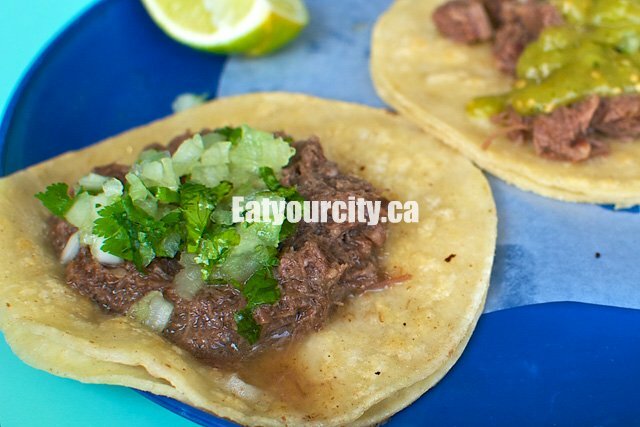 If your previous experience with tacos was that of a hard shell tacos from Taco Bell or Old El Paso… Well, pretty much ANYTHING would be better than that. 3) This is not a popularity contest or an "I like/love you!" contest. If you have an opinion, back it up with solid concrete points. Just because you eat there everyday can also mean you are lazy to walk across the street. Just because you drove three hours to go to Tres Carnales, it could be because you are sick of (insert regional cuisine here). If it is a reasonable substitution, well, that works but say what it is substituting for! 4) "Authentic" cuisine is a marketing plot. Once you are outside of the location of origin, some compromises will be made: either ingredients or taste buds or some je ne sais quoi. 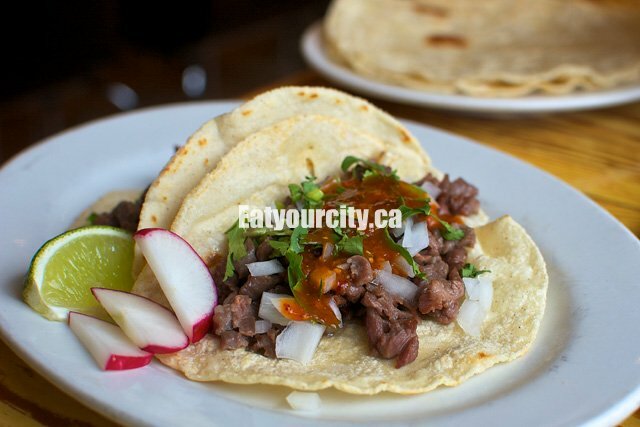 For example, the tortillas used in Tres Carnales and La Taqueria aren't made in house. 5) Just because they say so does not necessarily means it is true (see above). And just because they are of that country of origin, does not automatically mean it is good either. I have had bad "Chinese" food made by Chinese people (*cough*Chicken for Lunch*cough*), as well as quite decent French food made by non-French. 6) Despite Alberta is considered to be a conservative region, try expanding your horizons. As shown above, there are different forms of tacos. In this case, the author of this blog expressed their opinion with some evidence. I am supporting my opinion with evidence myself. The question is, if you are going to comment, what is your supporting evidence? 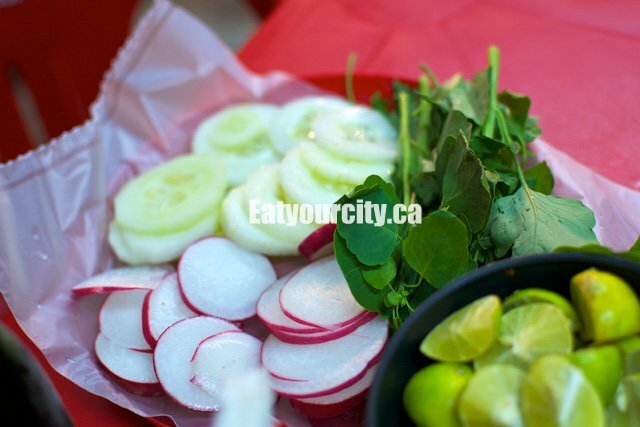 And, to close this post, if you need to ask, if I were to rate all these places, it would be: Mexico City (doh!) followed by La Carta. What about the rest? Didn't I mention I don't care Mexican food? If you do care, expand your horizons and try to find it yourself! "PluckedTurkey"? Who are you kidding?! I thought Kim Ho had "retired" from blogging after that last highly arrogant and offensive post... obviously not. This post has his "holier-than-thou" style splashed all over it. 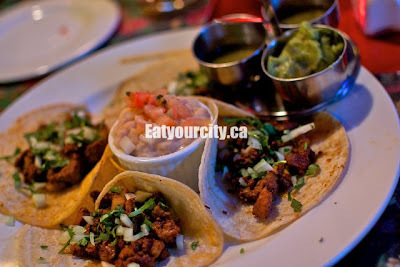 I have eaten at Tres Carnales, and do I think the food is off-the-chart the best in W. Canada for Mexican? NO... Do I think it's always absolutely authentic? NO... but I love the passion the owners show for their food and clients and I think that is the secret to their success. My issue here isn't about whether Kim liked Tres Carnales or not (each person is entitled to his/her opinion), my issue is in WHY this post was written in the first place. The first line says, "Before you continue reading, this is NOT nomnomnom, the usual writer for this blog. Instead, in sort of a request, nomnomnom has been asking me to write a guest post for a while..."
I'm questioning why the post started off in such a defensive manner. If you're hoping it would ward off the Tres Carnales "wolves" as Kim put it here, the defensive start actually takes the objectivity out of this post. 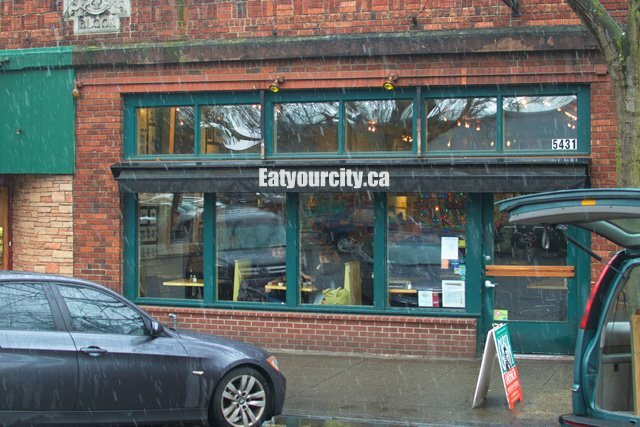 It's as if you the real bloggers of Eat Your City couldn't man up and write a second review in fear of further criticism. Funny, Kim would associate himself with this since in his words, "I believe everybody ought be able to express their opinions, at the same time, I believe, if you do so, you ought to be responsible for what you say, too." Since he used Mexico City as a point of reference here, I think it should be stated (in an analogy that he would be familiar with) that Mexican food like Chinese food comes with major differences in flavours and style from every region of China. By no means does going to ONE city in Mexico and consulting with ONE of your "Mexican" friends makes you an expert. I don't think you'll post this comment out of protection for your dear buddy (and your protector) Kim Ho. But the Kim that wrote that "last bang" post had continually said he doesn't take criticism of his writing personally so I will add I also don't think you'll post this comment because you wouldn't want this public criticism of the fact that you didn't have the courage to blog as you saw fit and do a second review yourselves. I've asked some of my friends to guestblog for quite a while - it gets pretty expensive eating out all the time, and its nice to get other people's perspectives from time to time. Since I usually write on this blog, letting readers know PluckedTurkey is a guestblogger for this post is clarification. 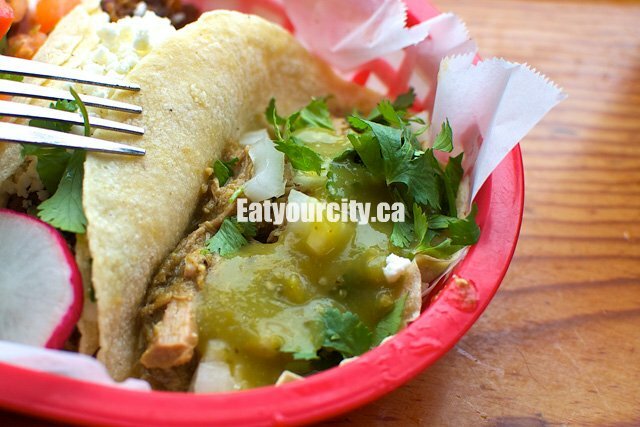 There's a few more guestposts coming up later on- so yes Tres Carnales was on PluckedTurkey's radar as its a trendy place (for Edmonton), but your protectionist comment was out of line. a) I have the guts to put my name in my comments. The fact you don't, tells me enough. c) "Plucked Turkey"? I am not "smart" enough to come up with such silly nickname! 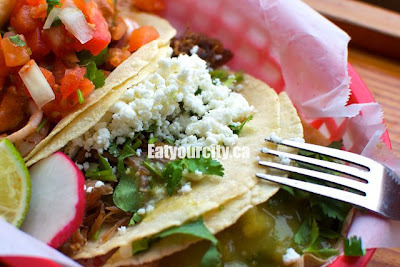 But, hey, if you are such fan of Tres Carnales, just as nomnomnom said, good for you. That also means that, if I am in Edmonton and want good food, I don't have to be fighting for a table in other (better) restaurants in town! Obviously you felt the need to make another blog post with respect to tacos... Seriously? Move on already!!!! 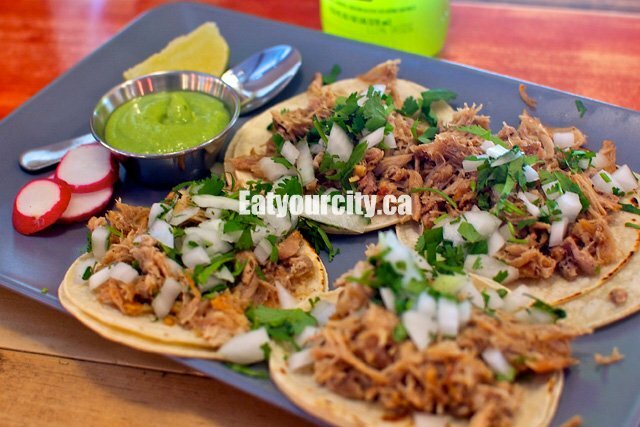 Check out Acajutla on 107 Ave in central Edmonton for another take on tacos, this one with a southern Mexican/Salvadorean flavour. They have lengua (beef tongue) too; first time I had it (with a Mexican-born friend) I felt a bit queasy, but it is soooooooo tasty!